Each month I will describe sights of interest in the night skies of South Carolina. These sights will be broken down into three sections; what you can see with the naked eye, with binoculars, and with a small telescope. The best time to view the night sky is at and around the times when the Moon is not visible, what is known as a New Moon; which will occur on December 27th. For December, your best viewing nights will be from December 1st through December 4th, and December 16th through December 30th. 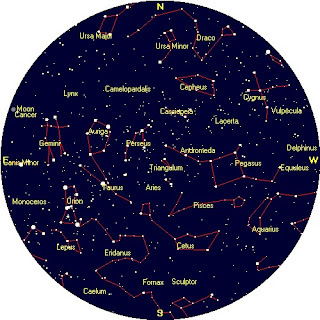 The Star chart below is set for Florence, SC on December 15th at 9 pm. I would like to direct you to look toward the south early in the evening during the early part of December. You should see only one relatively bright star in that direction; this star is called Fomalhaut. Now notice that there are very few bright stars anywhere near Fomalhaut. The reason for this is as follows. As you remember, our Milky Way galaxy consists of various spiral arms, as shown below. Our Sun resides in an arm know as the Orion arm. 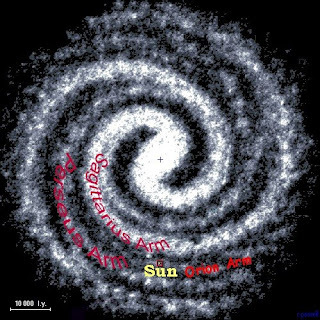 As we revolve around our star throughout the year, the dark side of the earth faces the Sagittarius Arm in the summer months, and in the winter months, the dark side of the Earth faces the Perseus Arm. So now for some additional perspective: In the summer when we look to the south to view the Lagoon, Trifid, Omega, and Eagle nebulas, we are actually looking across to the next inner spiral arm, the Sagittarius Arm. In the winter when we view the beautiful Double Cluster in Perseus, we are looking across 7000 light years to the next farther out spiral arm, the Perseus Arm. When we view the Pleiades, the Orion nebula, and the Beehive cluster, we are looking into our own arm, the Orion Arm. So what about Fomalhaut? We know that the Earth is tipped 23 ½ degrees on its axis. In the summer, the daytime side of the Earth is tipped downward toward the Sun. In the late fall/winter, the nighttime side of the Earth is tipped downward, so when we look low in the south, we are actually looking past Fomalhaut and down toward the “empty” gap between two spiral arms. Therefore, we are effectively looking down and out of our Milky Way galaxy into extragalactic space, thus the lack of many stars. See the diagram below, the white circle representing a super enlargement of the Earth. Hopefully, you were able to view Venus and Jupiter on November 30th right after sunset, at their closest line of sight approach all year; however, most of the southeast was rained out on that night. Throughout December, Venus will continue to rise in the sky, not reaching its peak until mid February. During this time, Venus will always remain an evening object, setting between 8 and 9 pm. This early setting is due to the fact that Venus is between us and the Sun, so it can never appear in the sky late at night, when the dark side of the Earth is pointing away from the Sun. That wonderful telescope target Jupiter will stay low in the west, nearly disappearing by the end of the month and will not return until next August. 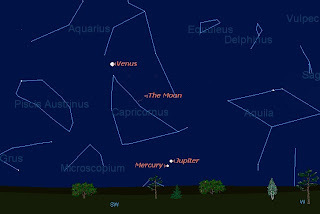 However, before Jupiter leaves, it will show us another “dance of the planets.” Just as we awaited the close line of sight approach of Venus and Jupiter on November 30th, very early in the evening on December 30th, and 31st, Jupiter and Mercury will make a close line of sight approach. Please put this on your calendar, because Mercury is one of the more difficult visible planets to see because it is so close to the Sun. 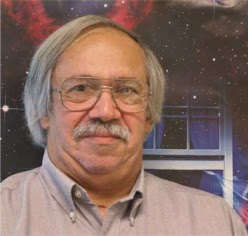 Anytime you may read that it is a good time to view Mercury, it is still sometimes difficult to be sure that you have really found it, and are not seeing a star in that region. However, on December 30-31st, you can use the bright planet Jupiter as a guide, and Mercury will be right below it and to the left. This is how to be sure you will find Mercury. First watch Jupiter each night from the middle of the month onward, so you are used to its position as it lowers into the west. Next, as the 30th approaches, look towards Jupiter right after sunset. Once Jupiter becomes visible, it may be too bright to see the dimmer Mercury, so look at Jupiter with a pair of binoculars, and Mercury should be visible. With luck, and if you have a clear horizon toward the west, you should be able to easily see Mercury next to Jupiter with the naked eye after 6 pm on these dates. The December 30th chart below may help. The Pleiades, of course. With the return of Orion, the Orion nebula (the apparent middle star of Orion’s sword) is always a good target. Also, be sure to use the binoculars to help you locate the planet Mercury, as described above. Aim your telescope at the Orion nebula, and try to resolve the gas cloud, and the newly born stars.